What do Zeus, Apollo, and the gods of Mount Olympus have in common with Odin, Thor, and the gods of Valhalla? What do these, in turn, have to do with the shades of Hades, the pharaohs of Egypt, and the glories of fabled Atlantis? In 1679, Olof Rudbeck stunned the world with the answer: They could all be traced to an ancient lost civilization that once thrived in the far north of Rudbeck’s native Sweden. He would spend the last thirty years of his life hunting for the evidence that would prove this extraordinary theory. ; more. Published at $23.00, our price only $16.95. A great book that belongs in every Atlantis library! 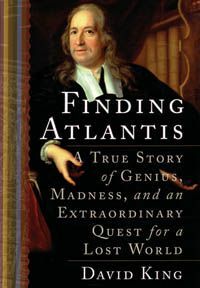 FINDING ATLANTIS: A True Story of Genius, Madness, and an Extraordinary Quest for a Lost World, By David King, 309 pages. 6x9 Hardback. Illustrated. Bibliography. Index.